Think like a category designer. 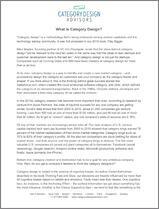 Category Design is strategy and a methodology built around the goal of creating a new category of business. A new category is built around a problem no one knew they had, or a problem no one knew they could solve. 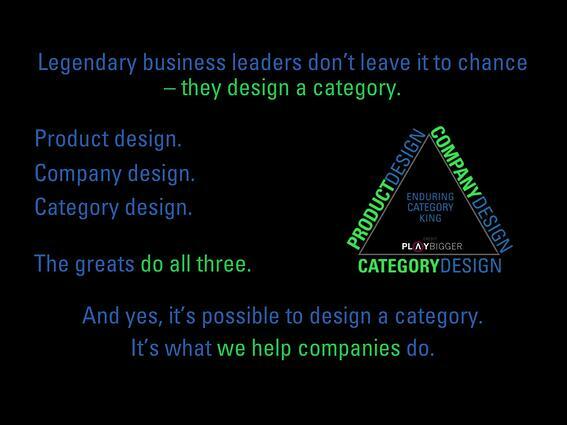 A great category creates a great company and product. Category Design is a way to identify a unique problem and show the market you have the solution. That’s how you stand out as different. 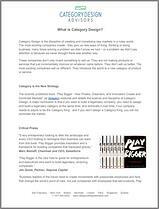 Category Design is an important part of a company’s overall strategy. It is a C-level process that can make an enormous difference in a company’s valuation, its position against competitors, the perception of analysts, and the mindset of customers. A groundbreaking discipline called Category Design is revealed in the book Play Bigger—How Pirates, Dreamers, and Innovators Create and Dominate Markets, Co-Authored by CDA partner, Kevin Maney. Kevin Maney is a bestselling author and award-winning columnist. He has been writing about technology for 30 years, has interviewed most of the tech pioneers you can name, and brings broad and deep context to Category Design conversations. He is co-author of the book “Play Bigger,” and has been an A-list writer and thinker about technology for 25 years. In this farsighted, pioneering guide, authors Al Ramadan, Dave Peterson, Christopher Lochhead, and Kevin Maney rely on data analysis and interviews to understand the inner workings of “category kings”—companies such as Amazon, Salesforce, Uber, and IKEA—that give us new ways of living, thinking or doing business, often solving problems we didn’t know we had. In 2017, Replicon was a twenty-year-old software company with operations in Silicon Valley and Calgary, Canada. The company billed itself as “Time management for your entire workforce,” and was one of many successful companies in a crowded, competitive market for time-tracking software. Replicon sold the kind of technology plumbing that every enterprise needed, but it didn’t make anyone very excited. The leadership team at Replicon had interesting ideas about a category it could define and develop. Time-tracking software gathered a lot of data about what employees were doing and when. In an era of IoT devices, big data and artificial intelligence, Replicon saw a way to tie time-tracking data to other data generated by an enterprise, and build AI to spot trends and opportunities for doing things better. 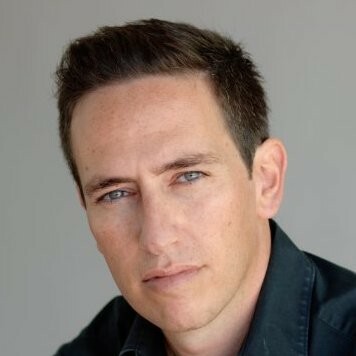 In early 2018, BigPanda’s web site pitched the company as an “alert correlation platform.” The company was founded in 2012 by Assaf Resnick and Elik Eizenberg, and had raised more than $51 million in funding from top-tier investors including Sequoia Capital, Mayfield, and Battery Ventures. Yet the company was playing in a busy, established category of products that collected and sorted incoming alerts within data centers. The leadership team had bigger ideas, and turned to Category Design Advisors to help pull out and solidify those ideas and define a new category around them. Watch this video that outlines the thesis behind Category Design.